Let me say, right up front, I am not a fan of business books. I find the genre stultifyingly dull. Often entire books are written from what was, at best, a very brief PowerPoint's worth of ideas. The authors often seem uninterested in, or incapable of, writing decent sentences, so the bullet point lists, matrices, and icons that fill the pages are simultaneously intelligence insulting and sanity saving. Perhaps because the commercial sector valorizes efficiency above all else, its literature has come to do the same. 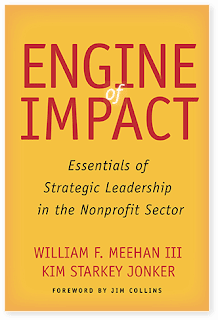 OK. Having gotten that out of the way, let me now express gratitude for Bill Meehan and Kim Starkey Jonker's new book, Engine of Impact: Essentials of Strategic Leadership in the Nonprofit Sector. For one thing, Meehan and Jonker have read the business press so I don't have to. More seriously, their message is important - the social sector has great responsibilities and concerns and improvement is both necessary and possible. Efficiency matters in service of mission. Meehan and Jonker have worked in the sector, studied their history, interviewed key players, and can compare and contrast what's known about the social sector with what's known about public agencies and corporate actors. The book is grounded in two careers worth of real work. 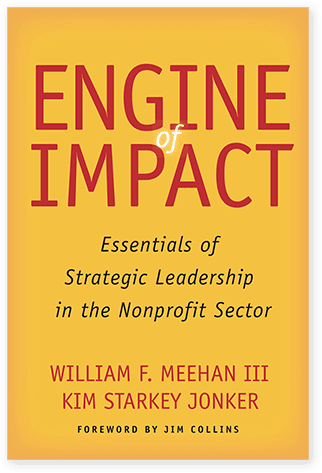 Now, as part of the business literature, Engine of Impact provides a requisite list of distinguishing attributes. In this case, it is seven elements of strategy and leadership that successful nonprofits demonstrate. If I were to excerpt the list here you would be hard-pressed to disagree with, or be surprised by, any individual item or even the whole list. It's not the list that makes this book - it's the wisdom from which they extract the list. Meehan and Jonker are not interested in platitudes. Meehan (whom I know, I haven't met Jonker) is a proud contrarian. He doesn't suffer fools. The introduction of the book lays out a quick history of how we arrived at what the authors call "The Impact era." In it they run the reader swiftly through the events of the last two centuries in the U.S. and zero in on the last two decades. Here they find a great deal of potential - from the building of a digital infrastructure for the social sector to the popularization of impact investing. To the authors, this potential has, for the most part, gone unmet. At this point I should note that the book's title has two meanings, or meaning at two levels. The "engines" of which the authors write are both individual nonprofits and the entire sector. They are motivated not just by the potential for better performing organizations, but by the need for a sector that can (and must) get better at contributing to the great challenges of our time. These contributions will come mostly (the authors argue) by working with government and corporations - the global challenges of climate change, population migration, economic dislocation - cannot be solved by any one sector alone. The idea that the social sector can both improve itself and, in so doing, improve and challenge, cajole and nudge other types of enterprises to greater action sets this book apart. Meehan and Jonker aren't providing the nonprofit sector with "lessons learned from commerce" because business knows best, but quite the opposite. There are plenty of lessons for nonprofits from business, but the social sector's opportunity (obligation?) is to act in such a way that businesses can follow. Collective, they (nonprofits) are the engine of a society that can collectively address its greatest challenges. The book also points out two things that every decent nonprofit professional knows, but is rarely listened to when she says it aloud. Boards matter and most of them are lousy, and fundraising is a critical part of the work that happens in irrational, resource absorbing ways. Meehan and Jonker's voices should be heard on these two points. They provide proof, they provide examples of better, and they're able to connect both the practical realities of individual organizations with the structural faults that keep those realities in play. Most of the examples in the book come from organizations of such size and scale that small organizations might wonder what the book offers for them. Stick with it, I say, as many of the examples taken from large organizations are of failure of strategy or limitations of leadership. Meehan and Jonker are not acolytes in the school of "scale at all cost." They are, as the title implies, interested in impact - accomplishing mission in measurable and meaningful ways. If you, unlike me, appreciate the efficiency of the business book genre then by all means, read Engine of Impact. If you, like me, find the business section of the bookstore the easiest one to skip past, this is one of the rare books worth stopping for.